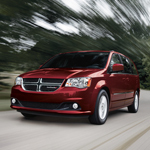 Are you considering a minivan for your next family-friendly vehicle? If you are, the 2018 Dodge Grand Caravan is an excellent option. One reason that it is a popular model among consumers is because it offers a number of innovative technology features. To find out more about the 2018 Dodge Grand Caravan technology features, we welcome you to read our content below. Three-Zone Automatic Temperature Control is offered with the 2018 Grand Caravan. This feature allows the driver and passengers to control the temperature settings in their area to keep everyone comfortable. SiriusXM Satellite Radio is also available with the 2018 model. You can enjoy more than 130 commercial-free channels that feature music, entertainment, sports, and news. At our Dodge dealership, you can browse through our inventory and take the 2018 Dodge Grand Caravan for a test drive.